Homeowners in many parts of the country are catching on to rain gardens – landscaped areas planted to wild flowers and other native vegetation that soak up rain water, mainly from the roof of a house or other building. The rain garden fills with a few inches of water after a storm and the water slowly filters into the ground rather than running off to a storm drain. Compared to a conventional patch of lawn, a rain garden allows about 30% more water to soak into the ground. As cities and suburbs grow and replace forests and agricultural land, increased stormwater runoff from impervious surfaces becomes a problem. Stormwater runoff from developed areas increases flooding; carries pollutants from streets, parking lots and even lawns into local streams and lakes; and leads to costly municipal improvements in stormwater treatment structures. How can I learn to plant one? 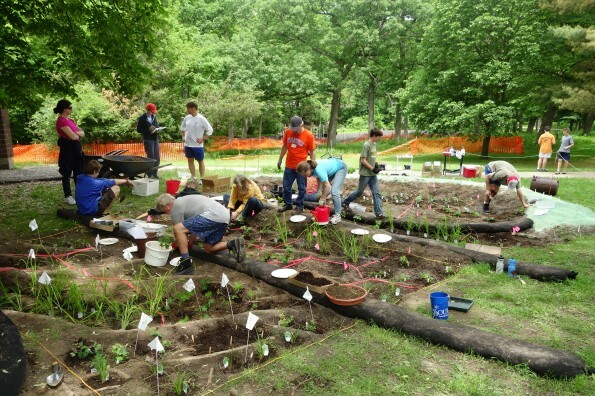 Learn with us during our rain garden design workshops and our hands-on community work days, where we go through the ABCs of soil preparation, planting, and maintenance of rain gardens. For an introduction, see the WI Standards Oversight Council DNR rain garden manual. Sue Ellingson has a very good web site (Sue’s Rules for Rain Gardens) that includes a wonderful plant list. Edgewood College also has a website dedicated to the topic. I want to see one. Where can I go to look at a rain garden? What is FOLW doing to promote rain gardens? Making a dent in street runoff with something as low tech as a garden is an idea with remarkable potential. A rain garden is a green machine that’s cheap and effective. The tough question is how to create gardens that look good and are easy to maintain. With this project, we hope to find some answers. FOLW wrote a grant to fund the Rain Garden Street. The money was awarded to the City of Madison, which has engineered the project and hired landscape designers Margaret Burlingham and Hope Oostdik. Neighbors on Adams St. met individually with Margaret and Hope to design gardens that suit them. The gardens were completed in 2006 as part of a previously planned street reconstruction.